The "Cen.Stu.Psi. ", a not-for-profit organization, is an association without political or religious bias. Its sole purpose is for scientific research in the fields of psychiatry, psychopharmacology and social psychiatry. The Executive Board is: Giuseppe Tavormina (President), Nicolas Zdanowicz (Vice-president), Mark Agius, Maurilio Tavormina, Martha Sajatovic, Francesco Franza, Dominique Tavormina. encourages and stimulates the scientific, clinical and diagnostic research while carefully gathering current studies of all psychiatric subject matters, therefore, implementing periodicals for distribution at national and international seminars, conferences and conventions. participates, collaborates and exchanges scientific knowledge with organizations similar to Cen.Stu.Psi. with psychiatric interest; be they public or private on a worldwide basis. shares and disseminates information of research developments to the scientific community, authorities and the public-at-large via mass media. 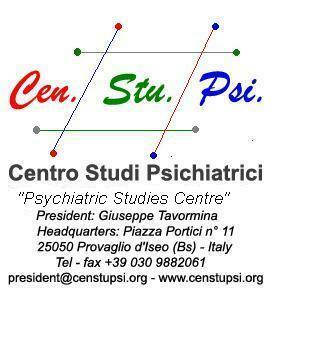 All Psychiatrists, Neurologists, Psychologists and Psychotherapists are invited to seek membership as a "Fellow" of Cen.Stu.Psi. so long as they share the precepts of the association.